As if it weren’t enough to keep track of arms trafficking, political mischief, and ethnic tensions around the world, now international aid agencies and national security watchdogs are told they have to watch temperatures, too. An article last week in the Proceedings of the National Academy of Sciences links warm years in West Africa with major civil conflicts (defined to include battle deaths of at least 1,000). The authors, led by Marshall Burke, an economist at the University of California, Berkeley, show that temperature has a stronger relationship to internal strife than typical indicators like per capita income or type of political regime. They predict more conflict in the region as the world warms. Other studies, noting the centrality of rain-fed agriculture in West Africa, have identified precipitation as a regional security indicator. However, the new study shows that temperature may be an even better index: it is a less volatile climatic variable and the negative correlation with precipitation means that the warmest years are often the driest. Temperature can affect agricultural yields both through increases in crop evapotranspiration (and hence heightened water stress in the absence of irrigation) and through accelerated crop development, with the combined effect of these 2 mechanisms often reducing African staple crop yields by 10%–30% per °C of warming. Because the vast majority of poor African households are rural, and because the poorest of these typically derive between 60% and 100% of their income from agricultural activities, such temperature-related yield declines can have serious economic consequences …. [B]ecause economic welfare is the single factor most consistently associated with conflict incidence in both crosscountry and within-country studies, it appears likely that the variation in agricultural performance is the central mechanism linking warming to conflict in Africa. 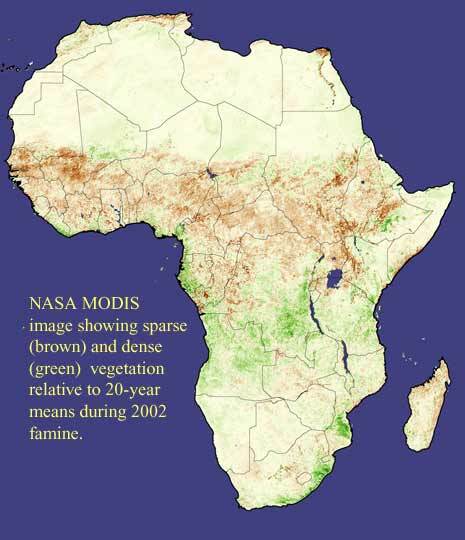 At the AMS meeting she will go beyond agricultural warnings to show how economic models of food pricing in disconnected local markets in West Africa can use biophysical indicators gleaned from satellite. Given that economic and sociopolitical considerations can overwhelm other factors in causing famine, “you can’t see food security from space at all,” admits Brown in a podcast available from EarthSky. However, she says, because telltale biophysical indicators are objective and can be seen from space early, they are highly useful for decision makers.